SBA is Back and Here for You! SBA's team in Milwaukee and Madison is back! We're here to help Wisconsin's 448,000+ small businesses start, grow, expand and recover. Get started at www.sba.gov/wi or contact our Milwaukee office at 414-297-3941 or our Madison office at 608-441-5263. Thank you to our resource partners at SCORE, the Wisconsin Small Business Development Center, Women's Business Centers WWBIC and Western Dairyland, and the Veterans Business Outreach Center, for their extra support for Badger State small businesses while we were out. And thank you to the Wisconsin Procurement Institute for their support for small business contractors as well. 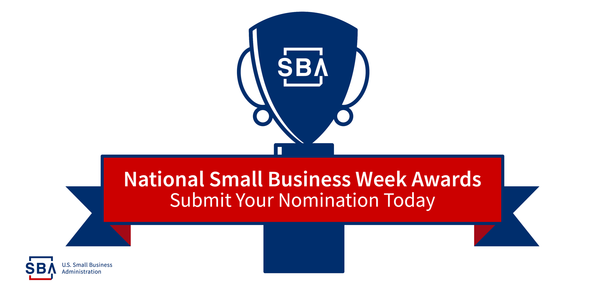 It's not too late to submit your SBA awards package! Share the story of your amazing small business and get recognized during National Small Business Week (May 5-May 11, 2019). Start here to submit a nomination and request the forms to complete the process. All completed submissions will be recognized. Check the calendar for the full listing!